Protea specialises in offshore and onshore engineering and equipment for the international energy sector. The company delivers turnkey handling systems for vessels, drilling rigs and oil production installations. 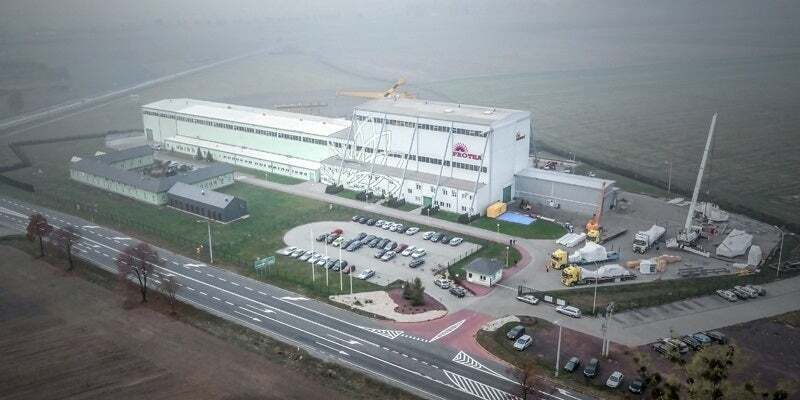 Core products include cranes, winches and bespoke handling systems with equipment being manufactured at Protea’s state-of-the-art facility in Kluczbork, southern Poland. PROTEUS® offshore pedestal cranes are suitable for installation on a wide range of offshore platforms. Protea delivers a wide range of cranes, including ram luffing, king post, lattice boom, knuckle boom, telescopic, marine cargo, heavy lift, windfarm service cranes. They comply with EN 13852-1 or DNV or API 2C or ABS and feature ATEX certified explosion protection. Electro-hydraulic, diesel-hydraulic and electrical drives are available. The following additional options are available such as man-riding winches, tensioning systems, active heave compensators (AHC), complete pedestals, and automatic overload protection systems (AOPS) and manual overload protection systems (MOPS). Protea is a leading supplier of offshore handling systems, including blow-out prevention (BOP) cranes with a lifting capacity of more than 550mT and a lift height of more than 20m. Since 2008, Protea has delivered more than 25 cranes for BOP handling to drilling rigs worldwide. Overhead or semi gantry, overhead bridge, and underslung dual separate girder designs are available. All BOP handling cranes are designed to meet the relevant international standards and can be provided with third-party certification by ABS or DNV. Protea manufactures a wide range of offshore winches for different applications, including mooring, anchoring, utilities, personnel, and guidelines. They are designed in accordance with DNV or the American Bureau of Shipping (ABS) with a range of alternative drum lengths and wire rope capacities. Protea designs and manufactures bespoke launch-and-recovery systems to meet specific client requirements. These typically comprise an Aframe, vehicle interface, associated winches and a control system. The company manufactures a range of well intervention handling equipment to support well intervention operations. These are performed on a turnkey basis or as individual system elements such as module handling towers, deck handling equipment; active heave compensated winch systems; hydraulic power units (HPUs); nitrogen generators and associated control systems. Protea designs and delivers tanks for drilling units in petroleum and gas industries for storing and treating drilling fluids, in addition to mechanically removed destructive solids and sediment. The set includes permeate, barite, fuel, reserve, suction, drilling, water, trash and other utility tanks. Protea supplies different other equipment such as land cranes, pneumatic trolleys, skidding systems and other equipment. With design offices, fabrication facilities, a blast and paint shop and assembly hall on one site, Protea can rapidly engineer and produce high-quality handling systems to meet a client’s specific requirements. On-site test facilities also allow comprehensive functional testing prior to delivery, which minimises potential delays during mobilisation and initial operations. Established in 2001, Protea operates on a global basis supporting international clients such as Aker Solutions, MH Wirth, Statoil, Transocean, Seadrill, Siemens, PDVSA and Canyon Offshore from its offices in Poland and representative offices in Molde, Haugesund, and Great Yarmouth. Protea is already well-known globally for delivering high-quality offshore and marine lifting and mechanical handling equipment, including cranes, winches and launch and recovery systems. Protea delivers bespoke and standard material handling equipment for marine, onshore and offshore markets. Demonstrating production capabilities of our modern cranes and winches fabrication facility. Protea is well-known for delivering high-quality handling equipment, including cranes, winches and launch-and-recovery systems for the offshore and onshore energy industries. Protea is well-known for delivering high-quality handling equipment including cranes, winches and launch and recovery systems for the offshore and onshore energy industries. Protea is well-known for delivering high-quality handling equipment, including cranes, winches and launch and recovery systems for the offshore and onshore energy industries. Protea is well-known for delivering high-quality handling equipment, including cranes, winches, and launch and recovery systems for the offshore and onshore energy industries. Protea is well known for delivering high-quality handling equipment including cranes, winches, and launch and recovery systems for the offshore and onshore energy industries. Protea has a well-deserved reputation for delivering high-quality offshore handling equipment, including cranes, winches and launch and recovery systems to global customers working in the onshore and offshore energy industries. Protea is well-known globally for delivering high-quality offshore handling equipment, including cranes, winches and launch and recovery systems. Protea continues to cement its position as a leading supplier of cranes for floating offshore production units with the delivery of a swivel maintenance crane for a new FPSO conversion. Drawing on more than 30 years' experience of supplying high-quality cranes for offshore applications, Protea has recently unveiled an all-new service crane targeted at the offshore wind industry. Protea is well-known globally for delivering high-quality offshore handling equipment, including cranes, winches and launch and recovery systems. It has recently further expanded its product range with the delivery of its first winch certified for man-riding operations for installation on the Maersk Gallant jack-up rig. Protea has recently completed the manufacture of a comprehensive crane package for an FSO that will be chartered by Total E & P Norge AS for operation at the Martin Linge offshore development.